All our projects are unique, and so our process is individually tailored to best serve each client. Time spent in the design and planning phase always reaps benefits once the project gets underway. At an initial meeting we will carry out a basic assessment of the site and discuss how you want to adapt the property to suite your needs. In this meeting we can offer general guidance about cost, timings and discuss a programme for the proposed building works. Our involvement in your project is entirely at your discretion, we can offer the full turnkey service or just assist you with the planning stages if you prefer. Our involvement can be defined by the following three stages. The first job is to produce a full set of CAD files for the building in its existing form. Typically we will need floorplans, elevations and a sections view. This is the first stage of the design process so we can begin to understand the property in its current form. As soon as the CAD survey files are available we can begin our design work, exploring how to tailor the design to your individual needs whilst working with the existing building as much as possible to keep the cost of construction under control. This process will involve your feedback at various stages as we explore the different options together. Once the plans are completed we will move onto to the submission of appropriate Planning Applications and its relevant supporting documentation.We will act as your agent during this process and will be available to laisse with the planning officers to guarantee your application the best chance of success. When planning permission is established, in order to proceed towards a construction start date, we will need to develop the details and deal with a number of regulatory issues. It is worth noting that much of this stage is carried out by other professionals, such as an engineer and a party wall surveyor. 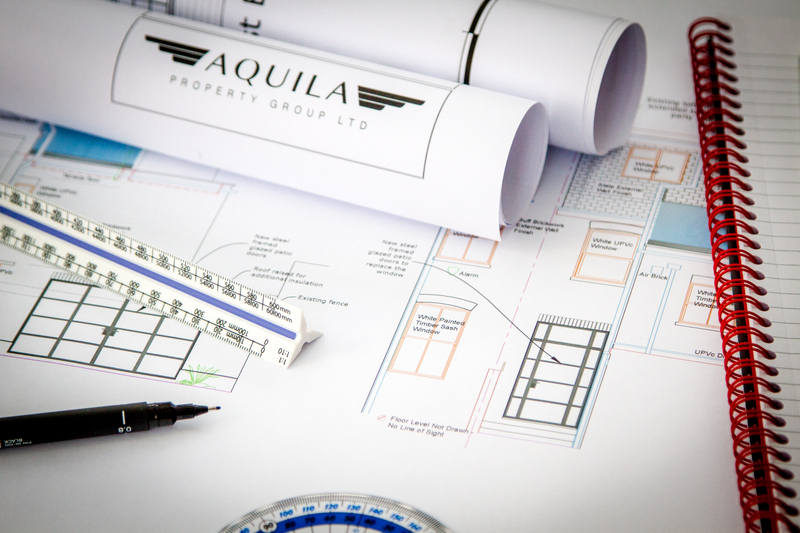 In these areas Aquila’s role will be to provide the necessary information to facilitate the work carried out by them. Please do get in touch to discuss how we can help you with your development! We will be able to provide you with a much more detailed description of our process one we have met you and understood your project. A fee proposal and quote of our rates of involvement can be submitted to you once we have a full understanding of how your would like to proceed. Get in touch with us today to discuss how we can assist you on your upcoming project.